A group of friends and I had decided to embark on the first of many snack bar crawls around Toronto. The trend toward small plate menus and relatively geographical proximity allows for a well structured venture to experience a number of tastes and concepts on a given night. What makes this particular group interesting is the diversity of food preferences and aversions. Instead of the Fantastic Five, we may be better referred to as the Finicky Five. First of all, none of us are fond of bad food. In addition, we have one celiac, one gluten intolerant, one fish aversion and a couple of gluttons (yours truly included). That said, I have my own dislikes and aversions, so it made for a bit of a long, tedious decision process at times. The first target area was Fashion district/Trinity Bellwoods. Starting at 430 pm, we arrived at Bar Buca which made sense considering its day long menu and happy hour in which a few complimentary snacks are provided. The drink menu has an array of wine and a number of cocktails both tradtional and unique. 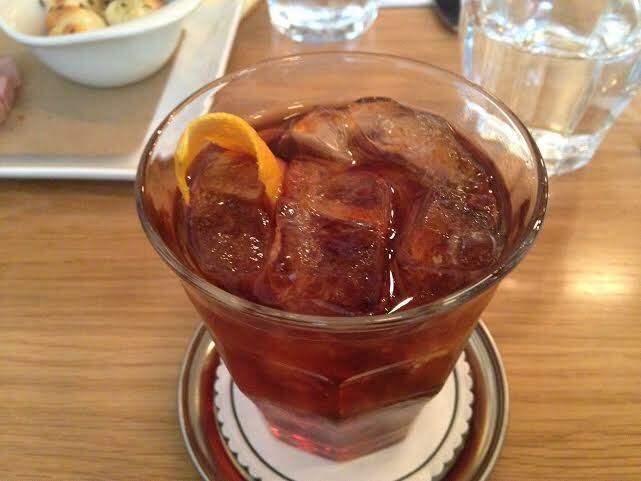 While my collegaues started with processo, I opted for a Sicilian Old-fashioned which was true to form. It was nicely balanced with an aggressive but appropriate amount of bitterness. At the same time, we were treated to a nice array of snacks as we decided on the menu. 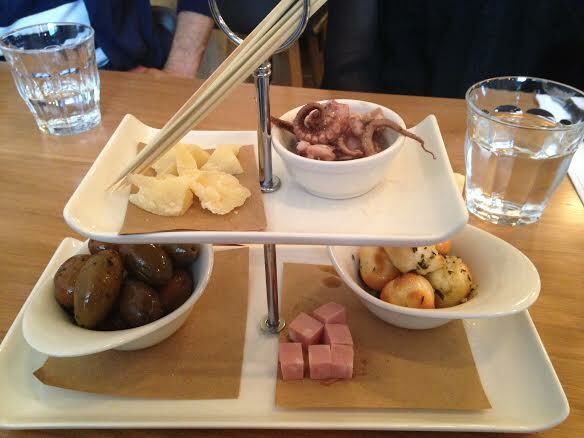 The small tower had olives, meat, squid, cheese and nodini (bread knots with rosemary and garlic). It was a nice way to start, especially given the diversity of eaters at the table. 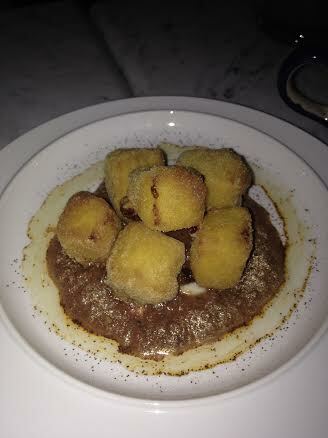 After careful consideration, we opted for the following four dishes: Ciccioli ($4)– Pork cheek with chili. Delicious taste and texture with a nice bite from the chili. A steal at four bucks. Vongole alla Carbonara. 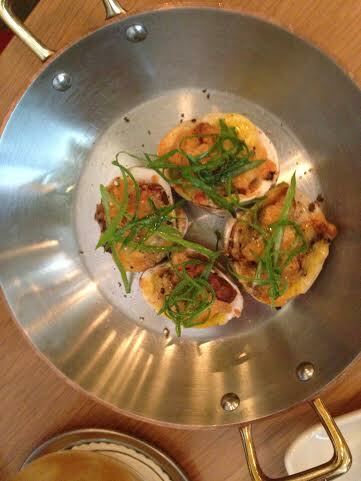 ($9)- Little neck clams, guanciale, egg yolk and amido. These tasty morsels were packed with flavour and were prepared without the use of pasta water, making them gluten free. Too bad..because I could have had more than one. 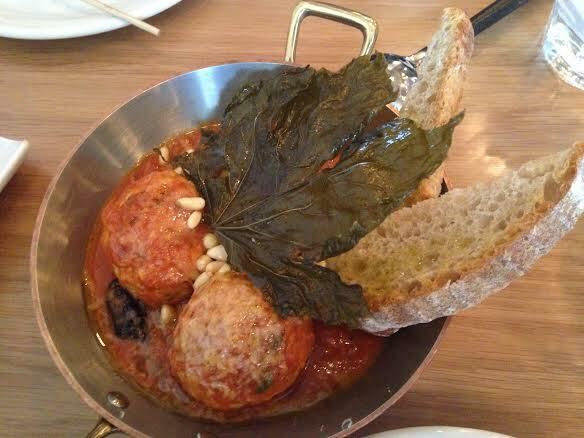 Polpette di Capra ($14)- Goat and Ricotta meatballs. Fantastic texture and moisture. Definitely tasted like goat. The tomato sauce cut nicely through the richness of the meatball. A little pricey. 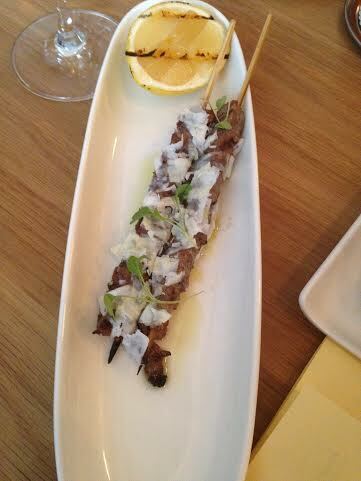 Arrosticini ($7)– Ewe’s meat, salmoriglio, aged ricotta and lemon. The meat was not dry and the salty ricotta and acid of lemon created a nice harmony….despite the fact I’m not a fan of lamb. My Take This is my second visit to Bar Buca and my first for dinner. Like breakfast, I remain impressed by the diversity of food and drink offered at reasonable price points. The service is professional and knowledgeable. The complimentary snacks are a great touch and make you feel part of the family. Despite the fact I don’t know a stitch of Italian, there is no pretension attached to the description of the menu items and they are very willing to accommodate diet restrictions. A nice start to the snack crawl, even at 430 in the afternoon. I wouldn’t hesitate to come back to try a few of the more adventurous choices such as immature smelts, offal sausage or beef heart or even stick to one of the stuffed fococcia or cold plates. 416 snack bar has been a thorn in my side for a while. I have attempted to go a few times but the waiting crowds have kept me away. Part of the reason is the small quarters and limited seating. Having arrived around 6, we were able to secure 5 seats around the bar before the dinner crowd arrived. I grabbed a local pint as we once again huddled to decipher what we could eat as a collective whole. Moroccan Vegetable Skewers ($6)– The safest choice on the menu, they were also pretty boring. Very modest seasoning atop cauliflower with a token olive here and there. Gluten-free and flavor-free. 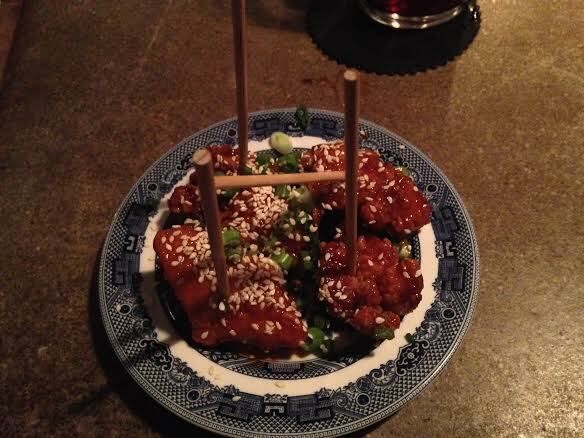 Korean Fried Chicken ($5)– Tasty, crispy morsels topped with fresh green onions. More batter than chicken but delicious flavour. 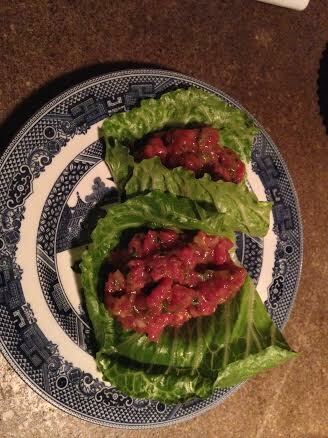 Steak Tartare ($7)-Ordered gluten free version atop lettuce instead of crostini. Asked for crostini after. Fresh and nicely seasoned, the bread worked a heck of a lot better than the lettuce. 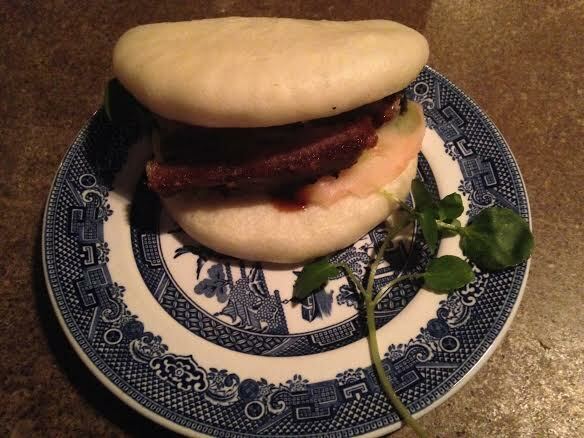 Pork Steam Bun ($5)– Bread was soft and the pork was crispy on the outside, tender on the inside and nicely seasoned. However, they have been utensil free since 2011 which made for difficult sharing since I couldn;t get a knife. At the same time, the couple beside me was using a spoon to ladle sauce onto something. Isn’t that a utensil? 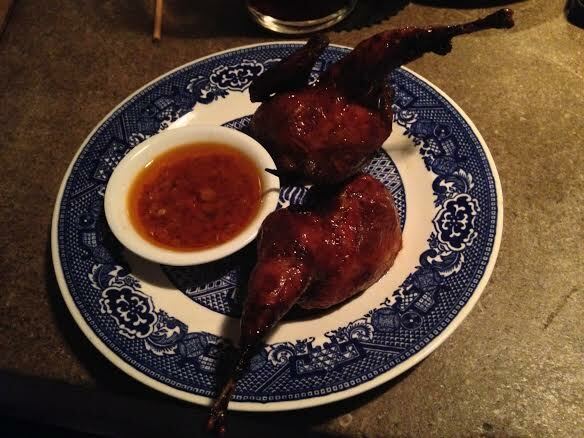 The churrasco quail for 2 ($13) was by consensus the best thing we had on the menu (partially due to the fact is was something we could all eat). The sauce was a great compliment to the nicely cooked bird. In a world where a 2 pc KFC dinner in considered a snack, don’t be alarmed at the definition of a snack for two at 416. I never know whether to respect or roll my eyes at gimmicks such as “no utensils since 2011”. It’s cute but proves a bit cumbersome at times. Perhaps I’m still annoyed by buddy beside me taunting me with a spoon while I tried to break a pork bun like the Eucharist. Maybe I’ll pull a John Catucci and pull a fork out of my shirt pocket and watch all hell break loose. 416 snack bar is loud and crowded but has a fun vibe and decent food. The price point is low but you really don’t get a lot of food. Wait, am I allowed to put this on urbanSPOON? This was my second visit to Lisa Marie. 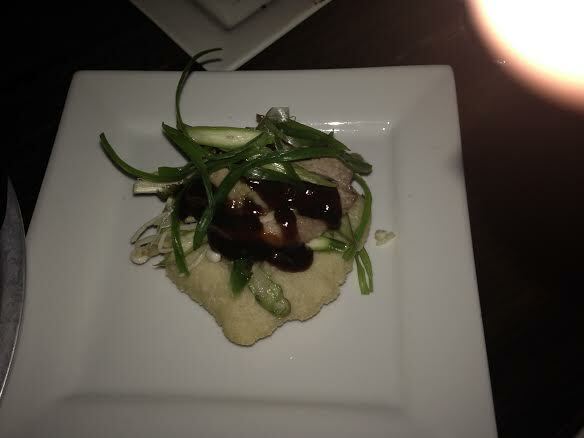 Memories of my first visit included the pork belly cheese thang and the getaway car (a Ceasar with a beer chaser). Needless to say, I was a bit dismayed to see the former missing from the menu. So, I put in faith in some of the other dishes that were offered on the menu. 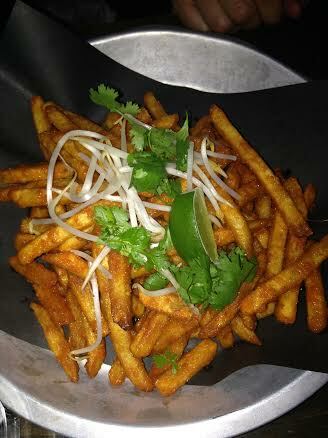 Pad Thai Fries ($12)- People rave about these fries. I expected a gloppy mess that I could spill on my shirt as I ate them poutine style. Instead, they were a dry,seasoned fry that resembled the coated fries from Cavendish. I suppose a few sprigs of cilantro, a dozen bean sprouts and a lime wedge was supposed to increase the authenticity, but I didn’t get it. 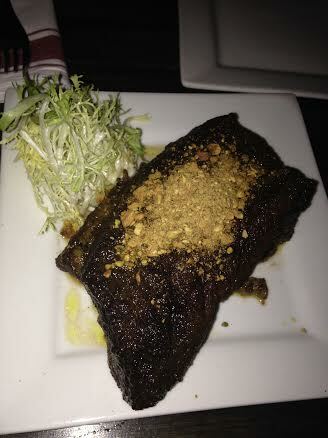 Moroccan Beef Rib ($15)- I had visions of he beginning of the Flintstones when this hunk of meat was delivered. I thought the table was going to tip over like Fred’s car. It was huge. The rib was fall apart tender but its sheer size made the seasoning almost undetectable. A crust would have been ideal to create some texture contrast to the hunk of beef. We all agreed that some kind of sauce (tomato based?) to cut through the richness would have a nice addition. We put our innovative minds together and ended up adding the beef to the pad thai fries which added some moisture to the fries and some flavour to cut the monotony of a whole lot of meat. 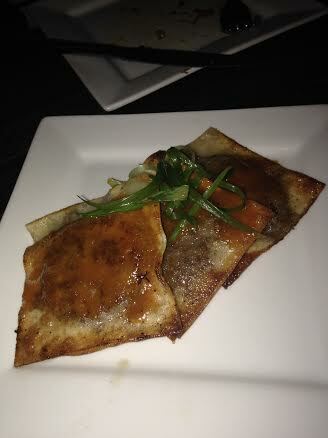 Bulgogi Ravioli ($11)– This was a smart dish that was ok. The beef was nicely marinaded and stuffed fusion style into pasta. The presentation was kind of sad and underwhelming for the price. Once again, a little sauce poured over or served on the side might had added a little punch despite the fact the filling was well seasoned. Deep Fried Pizza ($9)- After getting the Flinstone rib, we weren’t sure what to expect with the pizza so we were a little surprised to get a tiny piece of pizza dough with a couple slices of duck and a bit of slaw. The flavours were there but the portion size wasn’t. After voting Lisa Marie one of my favorite restaurants in 2012, I was a little disappointed. The crafty, brilliant snacks I had before have been replaced by inconsistent dishes from the perspective of size, value and flavour. The pad thai fries were generic and the rib was monotonously large. The vibe was different too. I’m not sure if it was an off night, but it lacked the energy of the previous two venues. The service was mediocre. 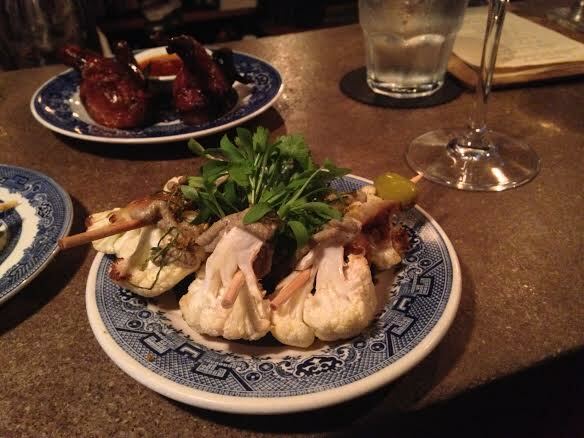 The getaway car was still delicious and they had a few bottles of wine under $25 on the menu. I guess even Elvis had a bad album or two. 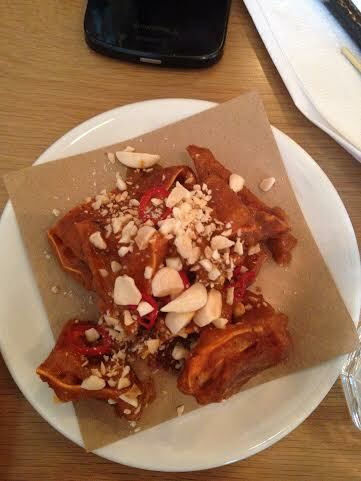 The final stop was Fonda Lola, the recently Queen St. stop promising fresh Mexican fare. We arrived around 930 to find the place still full. It’s a small venue which maybe seats around 30 or 35 including the bar. The decor had hints of Mexican influence but also had metal blinds covering the windows. The bar was a good size and had knives and forks fused into the covering. After a short wait, we were seated together and it was margarita time. I was intrigued by the kombucha (a new and emerging food trend) margarita. It was easy drinking although not what I would call traditional other than the 2 ounces of tequila. The menu, like the restaurant itself, was rather small, offering a dozen items including dessert. It offered a mix of traditional Mexican dishes combined with some dishes more indicative of the Queen Street dining scene. Trout Aguachile ($8.5)- A nice example of the combination of a trendy fish prepared in the style of a traditional Mexican ceviche. 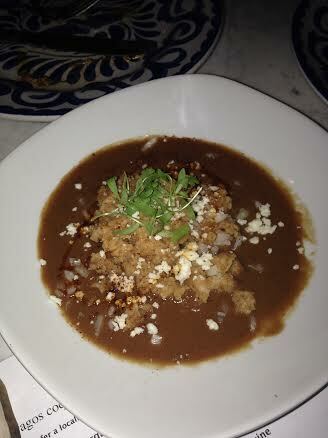 Frijoles and Cinnamon Chile Rice ($8)- Disappointing dish. The runny beans were confusing and the rice was unspectacular. I was hoping for popping Mexican flavour that wasn’t there. Panela Popper- ($7.5)- An attempt at a jalapeno popper, they were gluten free so there was some excitement at the table. The jalapeno was almost undetectable and in the end they tasted like blandly battered cheese sticks. The sauce on the bottom created a bit of a punch but nothing really memorable. 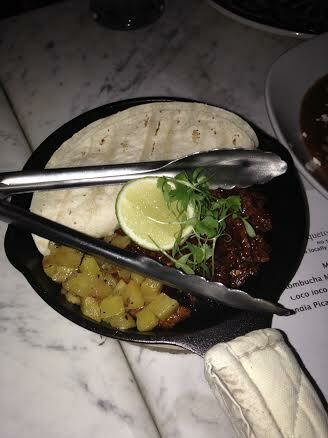 Taco al Pastor-Pork ($11)- The pork was decent but there were no condiments other than the pineapple which seemed seperate from the meat as opposed to the pator package. For $11 you got 3 or 4 shells full of boring. The concept of fresh is great, especially with Mexican cooking but it can’t come at the expense of flavour. The margaritas were fun and delicious even if not traditional. 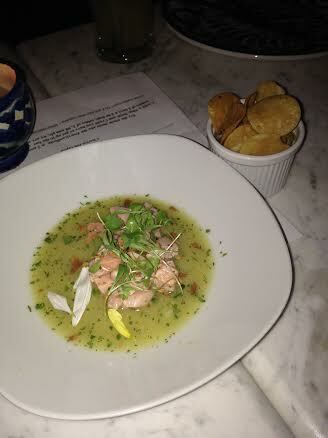 From a food perspective, the trout ceviche was smart..the rest wasn’t. The tacos were substandard, especially when compared to others which have graced the palates of hipsters over the last couple of years. The fried cheese was a poor attempt at healthy bar food and the rice and beans were a sad interpretation of the traditional Mexican dish. I can’t say I was Fonda Fonda Lola. The fashion frolic faded as the night went on. Things went south as we headed west. Bar Buca was the best of the night, offering good food and good service. 416 snack bar had a great vibe but no utensils. Lisa Marie has become less fashionable since my first visit. Fonda Lola was kinda mala…and that’s not the tequila talking. I look forward to taking a summertime schlepp down Ossington.